The Smith Ranch residential subdivision is ready for the first phase of Silverthorne’s newest workforce-housing project. The first phase will feature 17 single-family lots and eight duplex lots for a total of 33 new residential units on 8.5 acres. The Smith Ranch property is divided into two distinct sections with 52 acres dedicated to residential plots and another 11.2 acres reserved for commercial development. Altogether, the plan is to build more than 200 deed-restricted workforce housing units in the coming years. Smith Ranch is located off Highway 9 in Silverthorne between Ruby Ranch Road and Smith Ranch Road (just past Kum and Go and behind Our Lady of Peace Catholic Church). The project is big, not necessarily because of the size of the production, but because it could help people of all income levels find permanent housing in Summit County. Residences in the Smith Ranch Subdivision will come in a wide variety of sizes and price points. There will be single-family homes, duplexes and triplexes. All housing will be occupied by residents of Summit County who work at least 32 hours per week. All housing in the Smith Ranch Subdivision will be deed-restricted. Restrictions will include regulations on income caps, employment requirements and other measures designed to keep prices low and affordable for the local workforce in Summit County. The targeted-price range is 80-120 percent of the area median income (AMI). Generally speaking, that would put the least expensive residences at Smith Ranch in the low $200,000’s and the most expensive just shy of half-million. The Town of Silverthorne bought the property in 2008 and occupied it the following year. The economic downturn stalled the Smith Ranch project for a while until plans were revived in 2014. 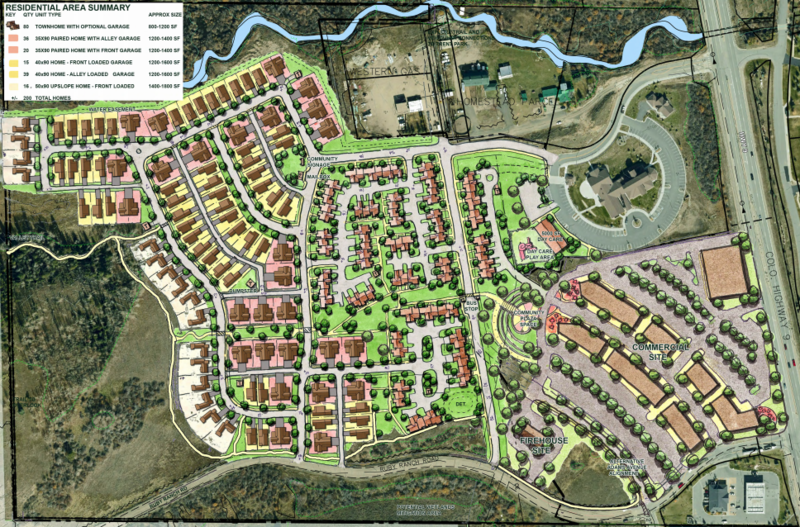 Silverthorne has identified Compass Homes Development to lead the development of this project. They are local and no stranger to large-scale, workforce-housing projects in Summit County. Compass Homes previously completed workforce-housing projects in Silverthorne, Keystone and Breckenridge. Silverthorne town staff reviewed the developer’s latest filing for the Smith Ranch and noted that all town standards are being met by the developer, including lot coverage, setbacks and density. It was also noted that the homes are actually over-parked, each features a two-car garage and two additional parking spots outside. No one else has that kind of parking in the county – Smith Ranch is setting the bar for other developers in the county in regards to deed restricted housing. If things continue at this rate, crews should be able to start going vertical on residences around early August. The plan is to continue building through the winter and have the first homes ready in early 2019. To learn more about Smith Ranch and how we can help you as a buyer, please call our office at (970) 453-1450 to speak with one of our qualified real estate brokers, or click here to learn more about out team.